How Natural Gas Drilling Has Impacted My Life by Molly M.
My driving habits have changed, too. I am looking into leasing a Prius, although I don’t drive a lot, so my CO2 discharges aren’t excessive. I combine trips and spend many days without using my car. I wish I could use other ways of transportation – in a rural area it is hard to use public transportation or walk to many services. Am I living greener? Definitely. Perhaps I would anyway – I have always touted being an environmentalist. Now it has become an absolute passion in my lifestyle. Gas Stock was an act of defiance. It signals that despite the odds, the politicos, the Westmoreland Club, the silence of the Sierra Club, the co-opting of Penn State, the compromising of Penn Future, the dearth of lawyer support, the PUC, the lobbyists, the campaign contributions, the advertisements, the unemployment, the bankrupt governments (desperate to close their budgets), the SRBC, the DEP, the Oil and Gas Act, the Energy Policy Act of 2005, and on and on … the movement will not give up. Beyond that, we owe it to our children and grandchildren. It was a day well spent. A day in the sun among old and new friends. Gas Stock was a gathering which spanned generations, politics, communities, and states. It was a campfire around which we joined as one. Thank you to NEPA Citizens in Action! Actually there was six of us. The person omitted in the Times Leader quote is blogger Hannah Abelbeck. Sending us off was yet another blogger, John, and his sister Sandy. They showed up at dawn to wish us well and record the riverside ceremony. Afterward, we started out, four bloggers and two sane people. (“By the time we got to Gas Stock, we were half a dozen strong…”) (apologies to Joni Mitchell). Our march paralleled in reverse the route of Toby’s Creek as it moves from the back mountains down to the valley, tumbling fresh water into the Susquehanna and eventually the Chesapeake. We started our journey atop concrete and asphalt, alongside traffic and amid big plastic signs and display windows. We left the streets in Luzerne and strode along an old railroad bed turned recreational trail. It parallels the highway which was once but a creek side foot path. Now the sound of traffic permeates the air. We eventually emerged from the woods onto route 309 in Dallas. It was pedestrian unfriendly from there to the fairground. 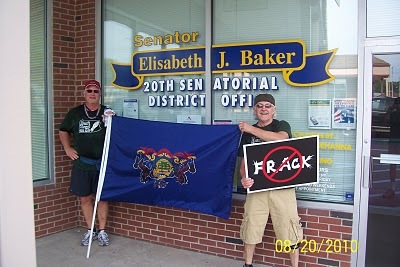 We stopped by Lisa Baker’s office but no one was there. We took some pictures and left tri-folds of information in the doorjamb. Lisa continues to believe this corporate invasion can be “managed”. How do you manage billions of gallons of toxic slurry left inside the shattered rock? How do you manage the diminishing water supply? How do you tell the regional water cycle it will have to do with billions of gallons less? How do you insure the infrastructure of wells are maintained and incident free for the next thousand years? How do you manage a hodgepodge of corporations, companies, and contractors from myriad states and countries whose only goal is the maximization of profit? The picture above is one taken at Baker’s office. You will notice the Pennsylvania State Flag is upside down. This was not a mistake. Don did it, as a sign of distress. Penn’s Woods is in serious jeopardy. Why: In Support of Gas Stock…and because I can! NEPA Citizens in Action is sponsoring an Environmental Concert/Festival/Rally which is intended to bring light, education and political pressure on the Marcellus Shale gas well drilling situation in our communities. The event will be held on August 21st, 2010 at the Luzerne County Fairgrounds in Lehman, PA from 12 noon until 7 pm. This is a family event, alcohol free and free to the public. Last night, just before midnight I bought the domain name rights to NoFrackMountain.com. I think this is what I am after and it seems to be the name that speaks to my mind. But what of FrackMountain.com? It speaks to an emotionally grounded irony should the corporate plan come to fruition. BUT! FU<K ENCANA! and their home boys. That is why I say, drop frackmountain, and dig NOFRACKMOUNTAIN! Sorry about the "fu<ks" But if any situatioin calls for it, this does… bend over . You are currently browsing the Frack Mountain blog archives for August, 2010.